In Nørrebro, Copenhagen. January lately over, and the Lord High Trump sitting in Trump Tower. Implacable February weather. Fog everywhere. Fog up the harbour, where it rolls among the masts of boats. Fog lying out over the lakes and hovering in the twinkling lights of Torvehallerne market halls. Fog pinching the toes and fingers of cycling Danes, gliding ghostly through the misty clouds. When the dense fog is densest, and the raw night is rawest, look for Restaurant Spontan. 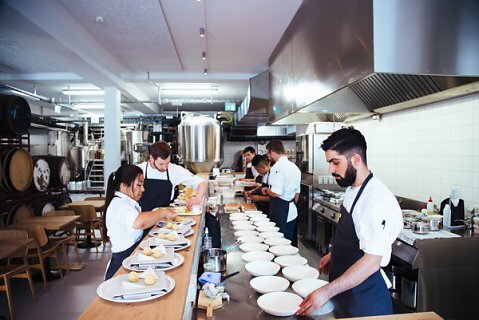 Here, chef Christian Gadient and the trio behind fêted brewery To Øl and bar Mikropolis have cast a former iron foundry in a new mould. Where old furnaces roared, now stand oak barrels and gleaming fermentation tanks. One half houses BRUS, a handsome brewpub. 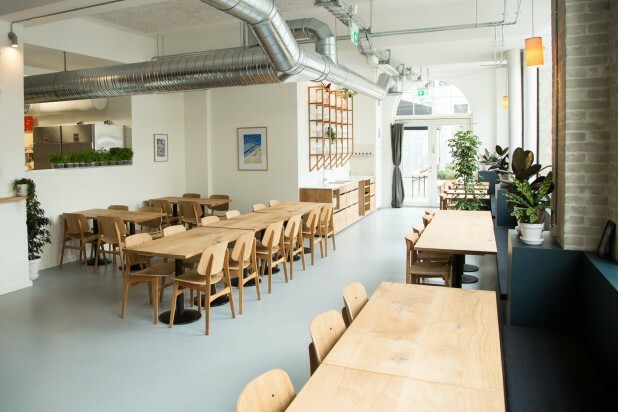 In the other, Gadient serves unfalteringly beautiful dishes with spontan – spontaneous – style. Boy, does Spontan’s fire burn the fog away. From the beer-warmed chatter of BRUS, we step beyond stacked ex-Chablis casks (ageing BRUS’s latest brew) and take our seats. Malt and yeast hang warmly in the air. Chefs cast a calm magic in the open kitchen and gander in procession through the diners to plate dishes at table. Open-hearted Trine and her floor team guide us deftly to the chef’s menu with wine or beer pairings. Beer for us, here of all places. And so it began. 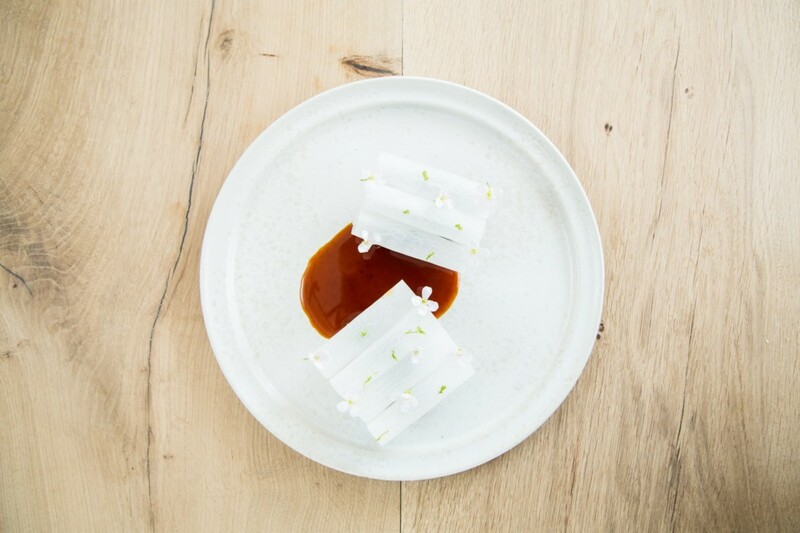 ‘1st Raze’ laid neat rows of almond, nibs of cauliflower, and razor clam in a fine dice with salted lemon beside a warm foam of cauliflower in razor clam stock. Its parts, deceptively stark, added up to a dish of texture and revelatory flavour that all this year’s dining is unlikely to better. ‘Old One Out, New One In’, a golden disc of confit egg yolk grained with bleak roe, all melding into a burned mussel stock, seemed the most sublime liquid crumpet, its face dimpled with pearl onion scales cradling burned chive oil and Lilliputian nasturtium leaves. ‘Beer Belly’ was a fine, sweet strip of belly pork in a glorious jus, fragrant with coriander and warm pearls of cucumber. A single sprig each of fresh yarrow, French sorrel, green sorrel and parsley provided meadowy perfumes that, eaten in turn, transformed each mouthful of meat. ‘Joy’ was just that. Another golden disc, this time of honeyed caramel dusted with sea buckthorn and flecked with liquorice. The freshest ice of ymer and cloudberry beneath. Alongside, a light sauce of sea buckthorn to pinch the palate. Talking of beer bellies, the flight of beers took us from BRUS’s funkily bitter Wheat Everyday – a shade too fusty for the delicate razor clams it paired – to Mosaic Saison from Anchorage and To Øl’s Tripel Trouble. All superlative. The drink of the night, though, was Yule Mælk. Just released, this extraordinary Russian Imperial Stout from BRUS was like Rasputin’s younger, hotter, hipster brother in a glass. A dirty night to match Joy’s innocent day. Gadient tells us that he wanted to find a more accessible way to offer fine plated dishes than the starched-napkin restaurants where he built his glittering CV. And so he has. With his four-plate menu at DKK475 or six at DKK 695 plus drink pairings, only the cold outside will make your eyes water. Just one of many reasons why we vow to return as we step back into the fog, hearts and bellies stoked against the chill by Gadient’s sensitive, eloquent food.